Recently I mentioned I was doing some light experimentation with Google Gadgets. I decided to create a gadget to retrieve a password from GRC's Perfect Password Page. Previously I had done the same thing while exploring Google App Script, and it seemed a good way to get my feed wet. So I am happy to announce a gadget that will not change the world but did teach me something about Google Gadgets: the GRC Passwords Gadget. This gadget does a very simple job. It connects to the Perfect Passwords page, retrieves the contents and parses out the requested password type (hex, printable and alphanumeric) and length. Nothing too tricky. What is more interesting is the usefulness of Google Gadgets in general. Gadgets do not seem to get a great deal of attention from Google these days but many of their products support them. You can write one gadget which can be added to iGoogle, Project hosting on Google Code, Google Sites, Gmail, Google Calendar, Google Maps (ie. 'Maplets') and any other container which supports Gadgets (such as Apache Shindig). 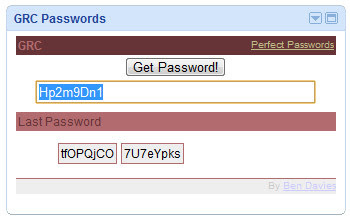 My GRC password gadget may never change the world but quick access to it within Gmail makes it very handy. For companies trying to reach customers deployed on Google Apps through the Google Apps Marketplace, gadgets are an excellent opportunity to escape the silo of your application and integration your service more fully with the rest of the the Google Apps offerings. Of particular interest is the only real development in Google Gadgets that I have noticed in recent history: Gmail Contextual Gadgets. These gadgets can appear inline in email messages based on the content of the email itself.